1Department of Pathology, Faculty of Medicine, University of Colombo, Kynsey road, Colombo 8, Sri Lanka; Department of Pathology, Sultan Qaboos University Hospital, Muscat, Oman. 2Department of Pathology, Sultan Qaboos University Hospital, Muscat, Oman. Department of Pathology, Faculty of Medicine, University of Colombo, Kynsey road, Colombo 8, Sri Lanka; Department of Pathology, Sultan Qaboos University Hospital, Muscat, Oman. Lokuhetty D, Al Bahari M. Successful Outcome of a Pregnancy Complicated by a Voluminous Placental Chorangioma: Case report with Review of the Literature. Oman Med J 2014 May; 29(4). Placental chorangioma is a rare, benign, placental neoplasm associated with a myriad foetomaternal and neonatal complications. Voluminous chorangiomas have frequent complications and adverse outcomes. The successful outcome of a pregnancy complicated by a voluminous chorangioma is reported herein, with the literature review. Chorangiomas mostly occur in primiparous women over 30 years of age, complicated by polyhydramnios, placenta praevia, ante-partum haemorrahage, premature separation of membranes, premature labour, toxaemia of pregnancy, hydrops foetalis and midterm intrauterine death. The neonatal period may be complicated by effects of low birth weight, cardiomegaly, cardiac failure, anaemia, thrombocytopenia and unsuspected congenital anomalies. This case had an unusually uneventful antenatal period for 36weeks, culminating in a medically unassisted, spontaneous, vaginal, breech delivery with a successful pregnancy outcome, in spite of having a voluminous chorangioma. Keywords: Voluminous chorangioma; Placenta; Pregnancy outcome. Successful pregnancy outcomes complicated by VC is relatively under documented. We report herein, a case of VC with an uneventful antenatal period culminating in a successful outcome at 36weeks of gestation, with review of the literature. To our knowledge this is one of the largest chorangiomas hitherto documented. A 31year old gravida6, para5 woman from a remote area in the Sultanate of Oman with no significant present/past obstetric history, was diagnosed with a large(>12cm) placental chorangioma by ultrasonography, at 33weeks of gestation. Imaging confirmed a breech presentation, intrauterine growth retardation(IUGR) and polyhydramnios. She was under regular surveillance at the Sultan Qaboos University hospital(SQUH) and was booked for an elective LSCS. However spontaneous labor commenced at home at 36weeks of gestation, a few days before the elective LSCS. She had a male baby by vaginal, breech delivery with an intact perineum en route to the SQUH. Her delivery was carried out by family members without medical assistance. The baby weighing 2.15kg was grunting, had tachypnoea, and cyanosis, with sub costal recession and reduced air entry on arrival at hospital. Respiration improved after immediate clearance of the airway and administration of oxygen in the hospital. The baby was on antibiotics for five days. Subsequent neonatal examination and investigations were normal with no evidence of congenital lesions, congestive cardiac failure, anemia, thrombocytopenia or cardiomegaly. The mother and baby were both well by the fifth day of hospital stay and was discharged. The placenta weighed 1297.6g, with placental disc measuring 19×18×3cm, umbilical cord measuring 55cm in length and fetal membranes. The placenta had a smooth, brownish bosselated mass measuring 13×12×6cm centrally close to the cord insertion on the fetal surface. (Figure 1) The mass comprised solid nodular brownish areas and blood filled spongy areas separated by bands of fibrous tissue. (Figure 2) Histology confirmed a chorangioma with areas of ischaemic necrosis (Figure 3). Figure 1: Placental disc with the bosselated brownish mass on the fetal surface. Figure 2: Cut surface of the bosselated brownish mass. 2. transudation caused by obstruction to blood flow by VC’s located close to cord insertion. 3. placental functional insufficiency caused by shunting of blood in to the chorangial vascular bed. Pregnancy progressed to 36weeks of gestation in this woman with a VC, polyhydramnios, IUGR and breech presentation. She went in to premature labor and had an uneventful vaginal delivery. The location is likely to be critical in determining the outcome of chorangiomas, as those as small as 2cm located at the outer placental edge has been associated with complications.6 Though this chorangioma was massive, its central location would have allowed the pregnancy to continue up to the 36weeks of gestation, with a relatively uneventful antenatal period. She also had a medically unassisted, spontaneous, vaginal delivery with a successful outcome, possibly facilitated by her multiparous status. While several chorangiomas have measured up to 12cm,4,11 only a few have measured 13cm or more. Table 1 compares the clinical/pathological features of these VC’s. VC that measured >13cm in the older literature have progressed undetected till delivery, with fatal outcomes.12,13 More recent VC’s measuring 13cm or more have resulted in live births by cesarean sections, with significant foetal/neonatal complications.14,15,16 This case is unique in comparison, as only low birth weight was encountered as a complication of prematurity. Fetal/neonatal complications of VC’s such as hydrops fetalis, cardiomegaly, cardiac failure, hemolytic anemia and thrombocytopenia were absent.2,5,17 Unsuspected/suspected congenital anomalies have also been described in infants with pregnancies complicated by chorangiomas.5,6,14 This neonate lacked any congenital abnormality. 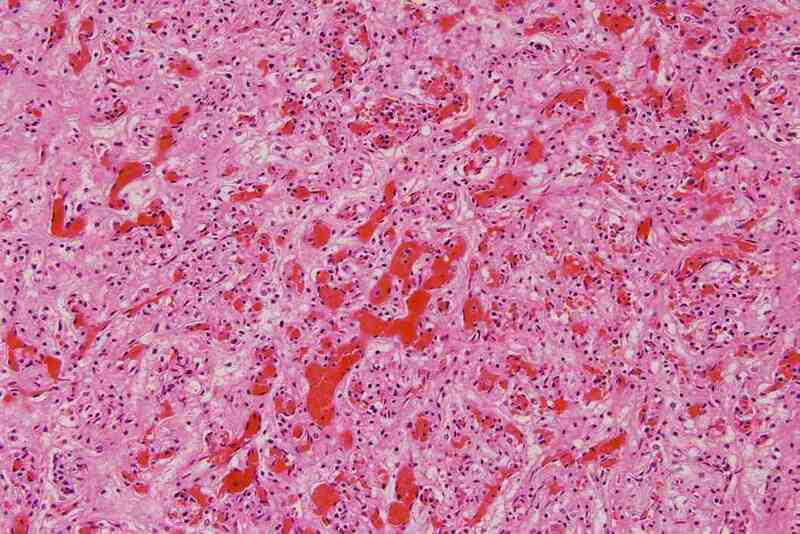 Chorangiomas comprise benign proliferating networks of congested capillary blood vessels. Unusual histological features documented include myxoid change and a haemangiopericytomatous pattern.18,19 Adjacent villi have shown arrested maturation.6 Rare proliferating malignant trophoblast have been detected among proliferating capillaries with high mitotic activity and large areas of necrosis in chorangiocarcinomas. Hitherto only few chorangiocarcinomas are documented, with its’ very existence challenged in the absence of metastasis.20 This chorangioma did not have unusual/malignant features. Table 1: Features of chorangiomas measuring ≥ 13 cm. VC’s may not adversely impact pregnancy outcome as demonstrated by this case. However considering the high incidence of complications, those identified with chorangiomas by ultrasound scanning during early pregnancy; need close monitoring and management of possible foeto-maternal complications. Delivery in a hospital setting and postnatal investigation of the neonate for congenital anomalies and, or the complications described above are recommended. Dr. Maha Mubarak Saleh Al Khaduri from Obstetrics and Gynaecology and Dr. Laititha Krishman from Neonatology Departments of Sultan Qaboos University Hospital, for management of this mother and baby. Amna Al-Shukeili, Biomedical scientist, Department of Pathology, Sultan Qaboos University Hospital, Oman for the technical support extended towards the images. Dr. Nesali Panapitiya, Research Assistant, Department of Pathology, University of Colombo, Sri Lanka for the contribution made towards literature search. We here by disclose that there is no conflict of interest including specific financial interests and relationships and affiliations relevant to the subject of the manuscript. 1. Clarke J. 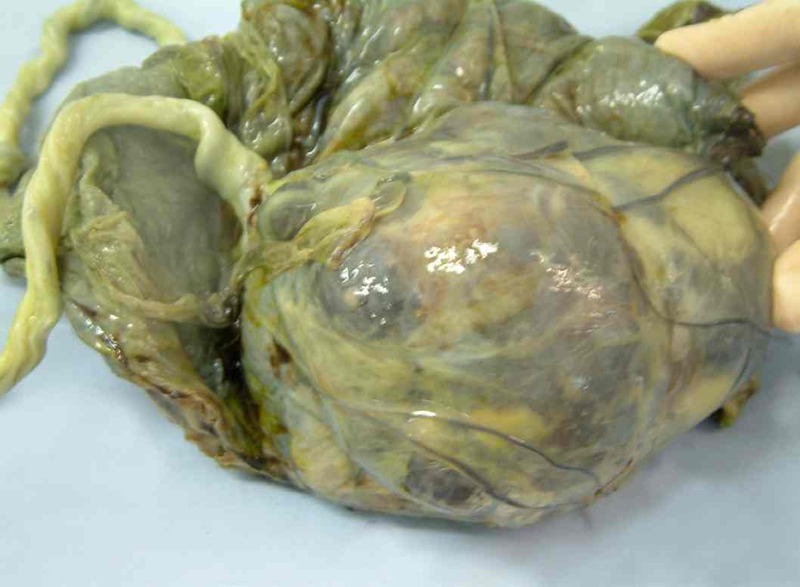 Account of a tumour found in the substance of the human placenta. Philos Trans B1,1798;361:88 in: Guschmann M, Henrich W, Entezami M, Dudenhausen JW. Chorioangioma- new insights into a well-known problem. I. Results of a clinical and morphological study of 136 cases. J Perinat Med 2003; 31(2):163-9. 2. Hoeger PH, Maerker JM, Kienast AK, Syed SB, Harper JI. 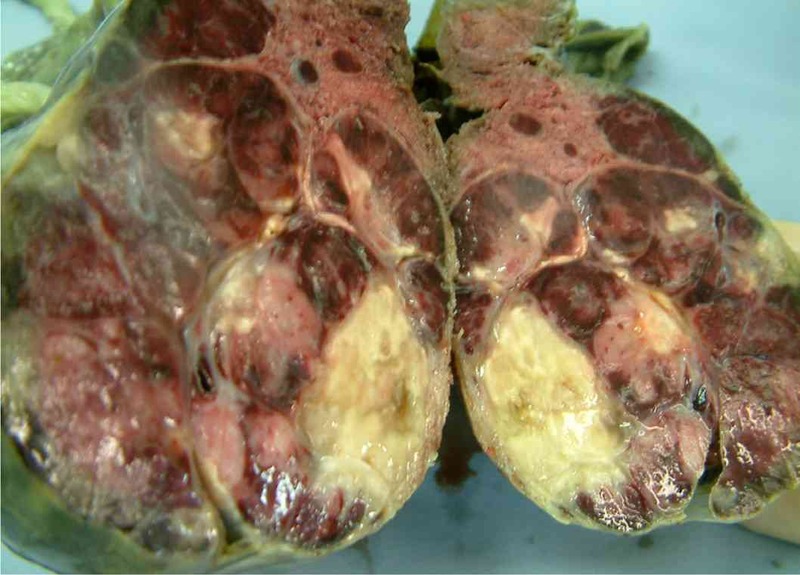 Neonatal haemangiomatosis associated with placental chorioangiomas: report of three cases and review of the literature. Clin Exp Dermatol 2009;34(5):e78-80. 4. Lawrence GC, Rettenmaier MA, Heinemann S, Chang M, Goldstein BH. A precarious pregnancy involving a patient with a large placental chorioangioma: a case report. Arch Gynecol Obstet 2008;278(4):383-6. 5. Kirkpatrick A, Podberesky DJ, Gray AE, McDermott JH. Placental Chorangioma. Radiographics 2007; 27(4):1187-90. 6. Guschmann M, Henrich W, Entezami M, Dudenhausen JW. Chorioangioma--new insights into a well-known problem. I. Results of a clinical and morphological study of 136 cases. J Perinat Med 2003;31(2):163-9. 7. Sepulveda W, Alcalde JL, Schnapp C, Bravo M. Perinatal outcome after prenatal diagnosis of placental chorioangioma. Obstet Gynecol 2003;102(5 Pt 1):1028-33. 10. Arodi J, Auslender R, Atad J, Weill S, Abramovici H. Giant chorioangioma of the placenta. Acta Obstet Gynecol Scand 1985;64(1):91-2. 12. Earn A, Penne DW. Five cases of chorangioma. BJOG 1950;57(3):442-444. 14. Akercan F, Seyfettinoglu SO, Zeybek B, Cirpan T. High-Output Cardiac Failure in a Fetus with Thanatophoric Dysplasia Associated with Large Placental Chorioangioma: Case Report. J Clin Ultrasound 2012;40(4):231-233. 17. Mara M, Calda P, Zizka Z, Sebron V, Eretova V et al. Fetal Anaemia, Thrombocytopenia, dilated umbilical vein and cardiomegaly due to a voluminous placental chorangioma. Fetal Diagn Ther 2002;17:286-292. 18. Bagga R, Suri V, Srinivasan R, Chadha S, Chopra S, Gupta N. Huge placental myxoid chorangioma presenting with severe ante partum hemorrhage. J Nepal Med Assoc 2006;45(164):366-9. 19. Sieracki JC, Panke TW, Horvat BL, Perrin EV, Nanda B. Chorioangiomas. Obstet Gynecol 1975;46(2):155-9. 20. Ariel I, Boldes R, Weintraub A, Reinus C, Beller U, Arbel R. Chorangiocarcinoma: a case report and review of the literature. Int J Gynecol Pathol 2009;28(3):267-71.